Why does Popular Science have to be so... science-y? 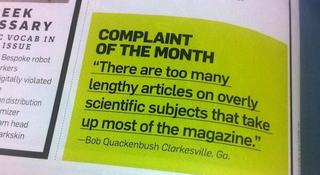 The latest issue of Popular Science features some counterintuitive commentary from one Bob "Words-Are-Hard" Quackenbush. I think what Bob is saying is that the print edition of PopSci could do with way more GIFs. At least one or two per page. Who needs words when you have, say, looping animations of carnivorous caterpillars?